This particular record is one of a group that got me started in collecting, a group originally owned by my great-grandmother and her father. I believe this one in particular was my great-great-grandfather’s, and like many from that bunch, it has seen better days. If you ever wondered whether a white family from Texas in the 1920s would buy vaudeville blues records, there’s your answer. This record also has the great distinction of being the first record by “Queen of the Moaners” Clara Smith. Smith, of no relation to Bessie or Mamie, was born in Spartanburg, South Carolina in 1893, and most details regarding her early life remain a mystery. In the late 1910s, she toured the TOBA circuit in vaudeville before moving to Harlem in 1923, where she began recording with Columbia Records. While in vaudeville, Smith gave a young Josephine Baker her first break in 1920, and she was good friends with Bessie Smith until a night in 1925 when Bessie got drunk and beat her up. Clara Smith continued to record until 1932, and died of a heart attack three years later in 1935. 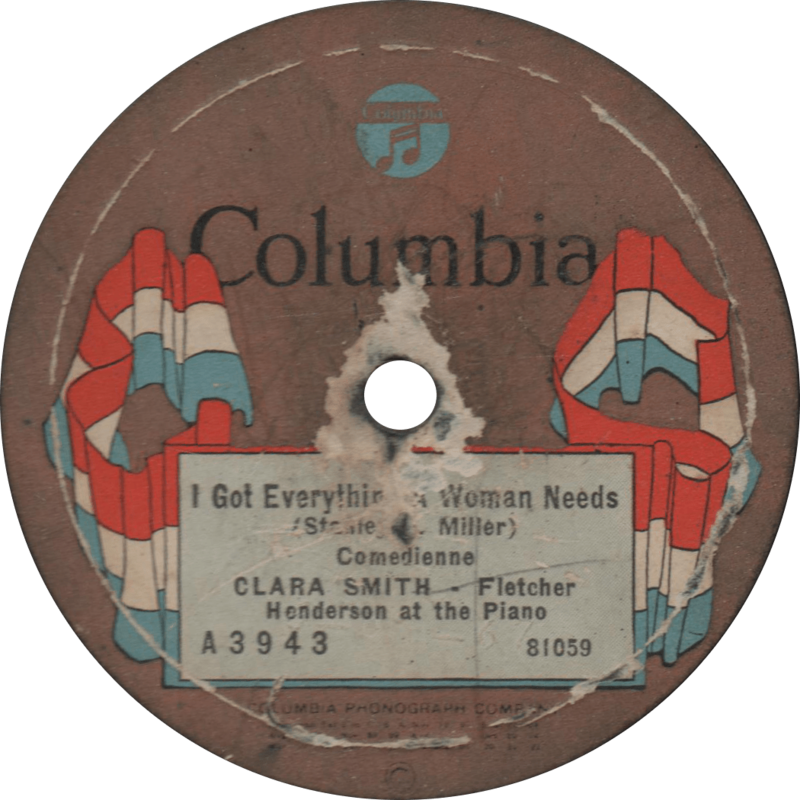 Columbia A3943, made several months before Columbia’s race series began, was recorded exactly 92 years ago on June 26, 1923 and features “I Got Everything a Woman Needs” and “Every Woman’s Blues” performed by Clara Smith with piano accompaniment by the great Fletcher Henderson. Rejected takes of these tunes were recorded a month earlier on May 31. First up, Clara moans Stanley S. Miller’s “I Got Everything a Woman Needs”, about Emmaline down in South Caroline who was “a vampire through and through.” This is the sixth take of the recording, the only one issued, according to the DAHR. I Got Everything a Woman Needs, recorded June 26, 1923 by Clara Smith. On the flip, Smith sings “Every Woman’s Blues”, also written by Miller. This one is take five out of six, also the only one issued. 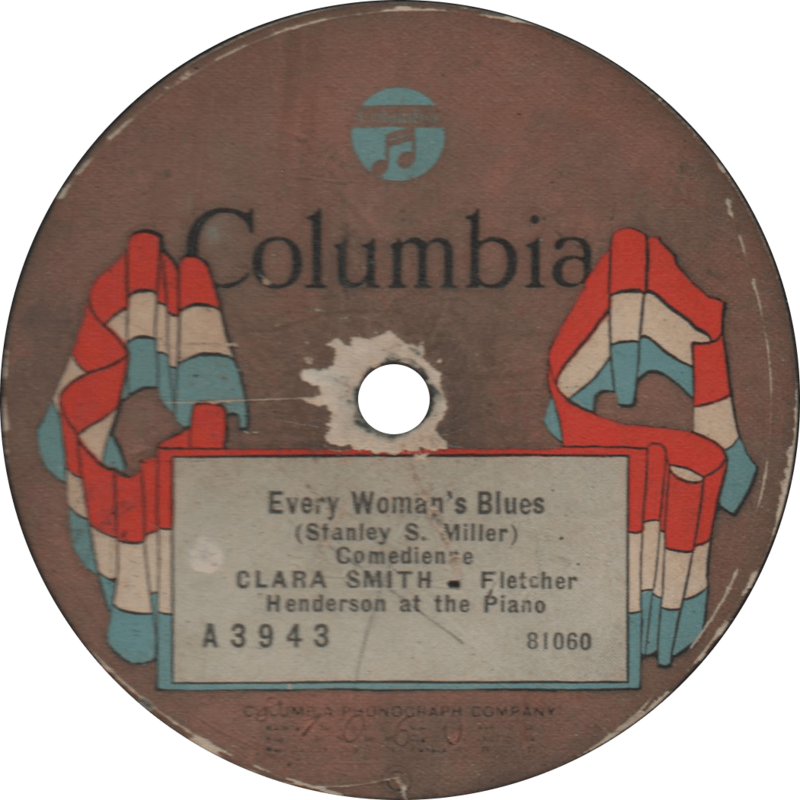 Every Woman’s Blues, recorded June 26, 1923 by Clara Smith. This entry was posted in Records and tagged 1920s, 1923, Blues, Clara Smith, Columbia, First Record, Fletcher Henderson, New York, Race Record, Vaudeville by R. Connor Montgomery. Bookmark the permalink.